I’ve always been a girl who believed in simplicity. 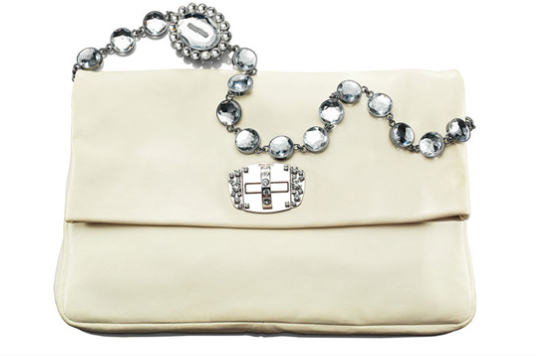 But as I held this soft leather bag and the beweled chain in my hands, I couldn’t help but fall in love with it. The soft pink color, the quilting with the surrounding studds and the jeweled chain all appeals to the young girl in me. In particular, the young girl who loved pink and spent her time dressing up her Barbie dolls and over accessorizing herself with plastic jewelries. This Miu Miu Stage bag combines all our girlhood fantasies into one. It goes against everything we’ve learnt about style and simplicity since then, but somehow the over the top details work together in this case and actually makes it fun. Just think of all the fun you’ll have playing dress up with it at home. It would also be the perfect compliment to a sophiscticated black (or white!) dress, and take you from Valentine’s day all the way to a summer cocktail. Now I’m not saying that all the Miu Miu Stage bags are to die for. I happened to think that this aquamarine color (above) works too in an elegant sort of way. But the contrast between the jewels and the black leather one just too big for it to be pretty (you can see the full collection here). The other two styles are also too extreme: one is too simple and the other is too embellished for it to work. One must be careful with these bejeweled chains bordering on tacky. I love the aquamarine one! I’m typically more drawn to pink, but the soft muted blue is really calling to me right now.